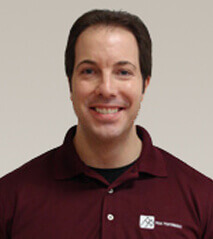 Anthony obtained his undergraduate degree in Biology from Quinnipiac University (Hamden, CT) and his Doctoral degree in Physical Therapy from Creighton University (Omaha, NE). Prior to relocating to New Bern in 2006, Anthony was the Director of Physical Therapy Services for Griffin Hospital’s Occupational Medicine Center (Shelton, CT) and was also an Assistant Professor at Quinnipiac University where he taught Biology, Cell Physiology and Anatomy and Physiology courses. Anthony’s continuing education experience includes Maitland, Mulligan and McKenzie courses as well as courses dealing with vestibular rehabilitation and the orthopedic management of the spine, shoulder, hip, knee and ankle / foot complex. Anthony is an avid sports fan having grown up in Rhode Island and enjoys exercise and outdoor activities. The greatest joys in his life come from his wonderful wife and two beautiful daughters.